William H. Dow, Professor of Health Economics and Kaiser Permanente Endowed Chair in Health Policy and Management, has been named interim dean of the UC Berkeley School of the Public Health, beginning July 1, 2018. Dow, a celebrated scholar of the economic aspects of health insurance, health behaviors, and health and demographic outcomes, joined the Berkeley faculty in 2004. 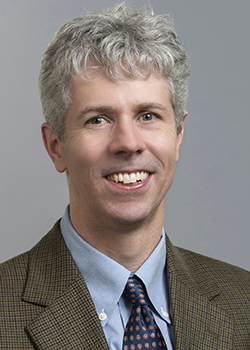 Since 2005, he has been the associate director of the Berkeley Population Center and, since 2013, the director of the Center on the Economics and Demography of Aging. He has also served at the School as a division head of Health Policy and Management and as the associate dean for research. “[Dow’s] broad academic interests, coupled with his leadership within the School of Public Health, will ensure that he provides a steady hand during this period of transition for the School,” UC Berkeley Chancellor Carol Christ said in a statement announcing the appointment. Dow's research contributes to improvements in health policy and healthy aging among vulnerable populations locally and globally. He has led teams analyzing California’s pathbreaking health insurance reforms and paid leave policies, as well as teams designing innovative behavioral economic strategies for preventing HIV and promoting behavior change such as smoking cessation. His global work includes serving as principal investigator of the premier team studying determinants of Costa Rican’s exceptional longevity, as well as ongoing work in Mexico, Tanzania, Thailand, and Japan. Prior to coming to Berkeley, Dow was an assistant professor at the University of North Carolina at Chapel Hill School of Public Health, and before that a National Institutes of Health postdoctoral fellow at RAND. He holds a PhD in economics from Yale University. Over the course of his career, he has served as a consultant for many local and global institutions, ranging from the Kaiser Division of Research to the World Bank. From 2005-2006, he was a senior economist at the White House Council of Economic Advisers. Dow is also a longtime research associate at the National Bureau of Economic Research, and has won the International Health Economics Association’s Arrow Award. Dow succeeds Professor Stefano Bertozzi, who served as the School’s 10th dean from 2013 to 2018. Bertozzi’s tenure was defined by growth in educational opportunities and collaborative initiatives that have increased the School’s ability to respond to complex public health challenges in California and around the world. In Bertozzi's last semester as dean, the School is moving into its new building on Berkeley Way. UC Berkeley is currently in the process of forming a search committee to conduct a global search for a permanent dean for the School of Public Health. The goal is to have a new dean in place by July 1, 2019.